Replications are reproductions of damaged or missing glass. Often the decision to replicate is made when it is determined to be the best or only option during restoration. 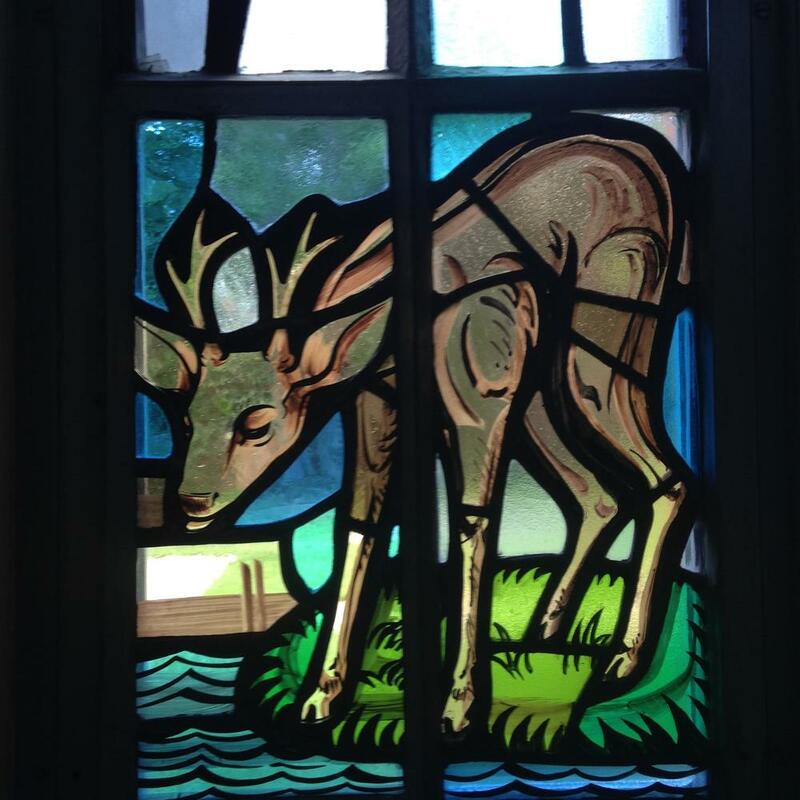 I began my training as a fellow in a studio specifically created to restore and preserve some of the earliest stained glass works created in the United States. I have replicated glass for houses of worship, museums, institutions, and historic homes. The first photograph shows the damage to the original painted face that was smashed into shards. The second photo shows replication painting in stages. The third photo shows the completed replicated face, the upper right shows an early stage (about 2 to 3 fired layers), the lower left is the original historic face, and the lower right shows a stage between the one above it and the completed head (about 3 to 5 firings at this stage). The last two photos show the full window and a detail after restoration. My replication is on the left, the original to the right. This was one of my earliest replications for flesh painting working for master craftsman and conservator, Jack Cushen. Here are before and after photos of this restoration. Occasionally clients bring in a job that looks like this before picture along with a garbage bag of glass. In this instance, there was very little photo reference of the original and much of the glass was missing altogether. In cases such as this, we are detectives that do our best to match new with the old and do the very best we can to create areas that meld with the original when we have no choice but the invent completely missing areas. Approximately 50% of the left panel of the deer was missing, shown in the before picture. The lamb is original to the church and guided the drawing and painting of the deer for replication. I was fortunate to have been contracted by The Metropolitan Museum of Art from 2006 – 2011 for several projects as a replication painter. Here are a couple images from the Langon Chapel at the Cloisters which I helped design out by doing the research and cartooning to retrofit the original glass to fit the gallery window openings, match glass by working directly with a glassblower, and paint new pieces to live sympathetically with the 13th century glass. Some photos of replicated pieces side by side. 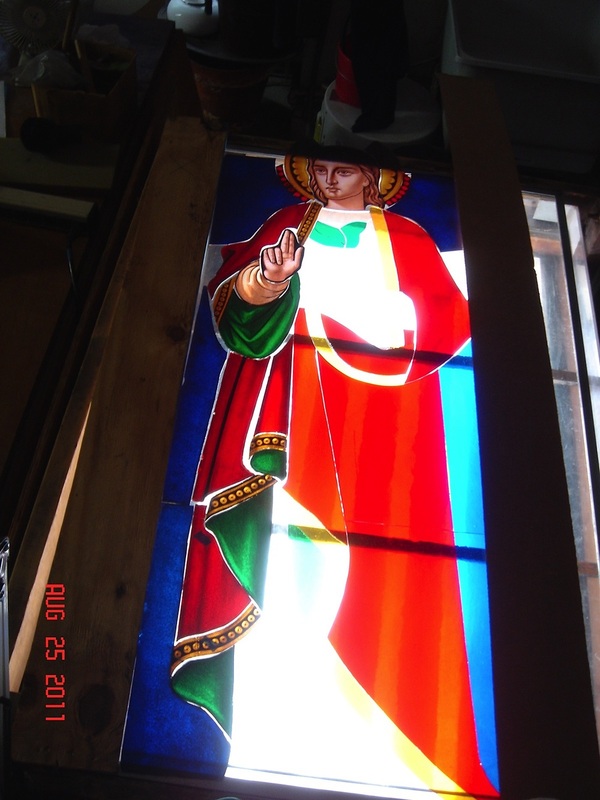 These photos show before, during and after restoration of the St John chancel window. As with the Legionnaire window, a large portion of the window required reinventing.